Since 1982, Chief of University Police Mike Gibson has made it his life’s work to protect and serve the University of Virginia community. He will retire this summer after leading the University Police Department for nearly 13 years. A Crozet native, Gibson started his career at UVA as a patrol officer. He took on a number of special assignments in his early years on the force and worked as a narcotics investigator on the Jefferson Area Drug Enforcement Task Force from 1994 until 1999. Following that assignment, Gibson was promoted to sergeant. He was promoted to lieutenant the next year, overseeing the patrol and investigative functions of the department. In 2005, Gibson completed the National Justice Command College. He was named interim chief of police that October and was appointed to the position on a permanent basis in January 2007. Achieving Tier One accreditation with the Commission on Accreditation for Law Enforcement Agencies Inc. in 2011 and reaccreditation three times since, most recently in late 2017. Adding an Explosive K-9 Unit in 2008. Creating a state-of-the-art property and evidence room in 2008. Studying and then implementing body-worn cameras and regionally approved policies for their use. Developing a Camera Control Center. Implementing a Cooperative Patrol Agreement with the City of Charlottesville that gives UPD officers jurisdiction in specified parts of the city that surround the University. Launching the Ambassador Program to improve safety and security in areas adjacent to the University that are frequented by students. Opening the Public Safety Substation on University Avenue. Gibson is a founding member of the Thomas Jefferson Area Crisis Intervention Team. 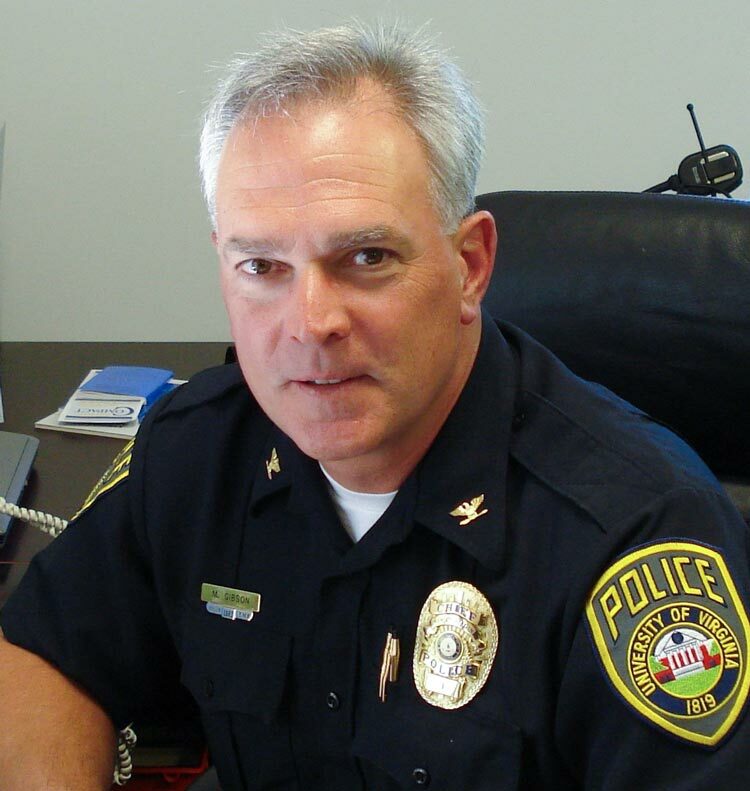 He was named Police Chief of the Year in 2008 by CIT International in recognition of his work that included a regional custody exchange program to improve the emergency custody order process for patients. Gibson has worked closely with counterparts in Charlottesville, Albemarle and the Virginia State Police, and with federal agencies including the FBI, the Drug Enforcement Agency and the Secret Service. “Chief Gibson has been a steady leader of the University Police Department throughout a period of significant challenges,” Executive Vice President and Chief Operating Officer Patrick D. Hogan said. “I appreciate his dedication, his expertise and his consistent focus on serving the University community by building a strong team in UPD. Hogan and Gloria Graham, the University’s new associate vice president for safety and security, have charged a search committee to identify candidates for the University’s next chief of police. Reporting to Graham, the chief of police will serve as the principal administrator in planning, directing and managing the comprehensive law enforcement and administrative components of the UVA Police Department. The chief will direct and administer the overall policing initiatives of the academic and UVA Medical Center communities, and develop and implement effective crime-prevention strategies, including a comprehensive community-oriented policing program. The chief also will work closely with other safety and security leaders on Grounds to administer a community-centered law enforcement and security program that focuses on education, safety and enforcement of University policies as they support and correspond with the University's mission. “I’m grateful to Chief Gibson for his longstanding commitment and service. He has positioned the University Police Department well to face the challenges of the future and is leaving a strong team for his successor to lead,” Graham said. Jason Bauman, Associate Athletics Director for Facilities and Operations. Andrew Baxter, Fire Chief, Charlottesville Fire Department. Gabe Gates, Assistant Vice President for Clery Act Compliance. Tom Harkins, Chief Environment of Care Officer (Medical Center). Rachel Harmon, Professor of Law (School of Law). Archie Holmes, Vice Provost for Academic Affairs. Tim Longo, Program Director, Public Safety Administration (School of Continuing and Professional Studies). Rachel Most, Associate Dean for Undergraduate Academic Programs and Professor (College of Arts & Sciences). Marge Sidebottom, Director of Office of Safety and Emergency Preparedness. Doug Walker, Deputy County Executive for Community Services (Albemarle County). Brian N. Williams, Visiting Professor of Public Policy (Batten School of Leadership and Public Policy). Additional information about the search, including how to submit nominations, is available online.